Nikola Tesla. By Napoleon Sarony. Source: Wikimedia Commons. 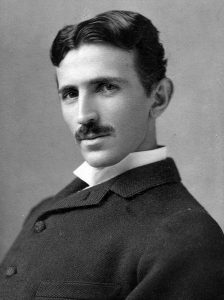 Nikola Tesla (1856 – 1943) was an electrical genius. He was a visionary who captured the imagination of engineers, entrepreneurs and the public with his futuristic concepts and vivid demonstrations of the power of electricity. He was the inventor of the first machine to effectively use Alternating Current (AC) electricity, the system of electricity still used today. Tesla also developed wireless telegraphy (ahead of Guglielmo Marconi), fluorescent lights, a remote control boat, and much more. Tesla believed his wireless technology could lead to world-wide wireless communications and free energy. It may be no surprise that most of Tesla’s ideas seemed fantastical to others. But he visualized his creations in such vivid detail – so vivid he often didn’t need diagrams to create his inventions – that his imaginings already seemed real to him. The challenge, of course, was to turn these images into real machines. Tesla’s greatest practical achievement is the development of the AC (Alternating Current) electrical system, which is used worldwide today. Electricity in its natural state is alternating, meaning that its direction of flow changes rapidly. It’s like a river flowing downstream, then upstream, then downstream, and so on, many times a second. It can be used in two different forms: Direct Current (DC) and Alternating Current (AC). DC is a continuous, steady current of electricity that never changes its direction. AC can have its flow changed up or down by passing it through a pair of coils, called a transformer. In the mid-nineteenth century, most electrical engineers considered DC electricity to be the only system practical for any purpose and AC of no practical use. They had not worked out how to use AC effectively. The DC system, however, used high voltage, making it very dangerous, and there was a loss of power over long distances. 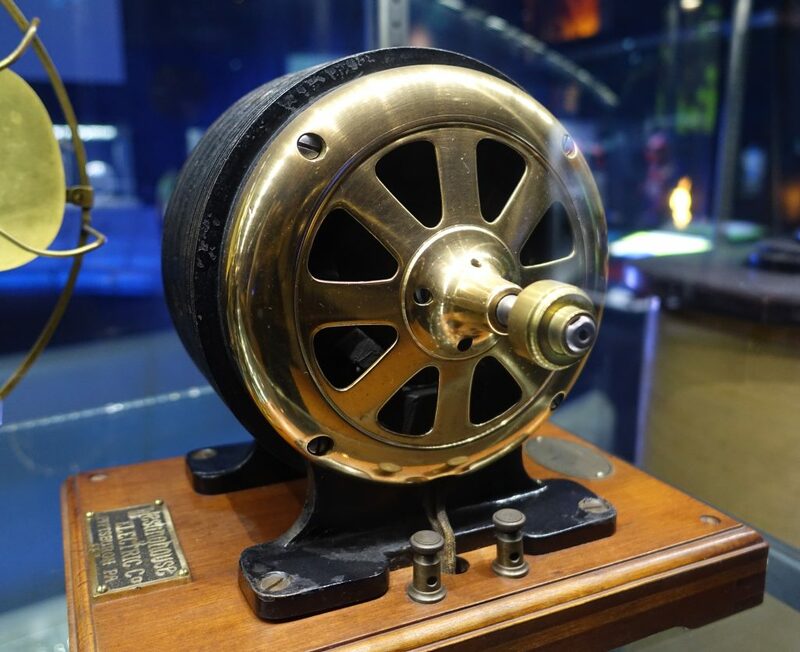 Tesla’s quest to develop an AC machine began when his physics lecturer at the Polytechnic School in Graz, Austria, demonstrated the latest direct-current Gramme dynamo. It was equipped with a commutator, a device that transferred the current from the generator to the motor. Tesla intuitively deduced that the commutator was unnecessary and that AC could be harnessed without this equipment. The professor dismissed Tesla’s idea that AC power could be used in this but the demonstration set Tesla on his quest to build an AC machine. 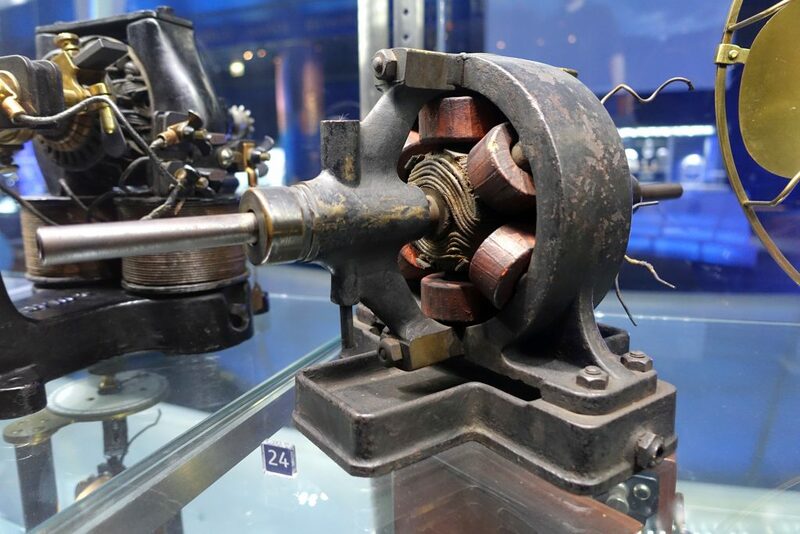 Tesla spent every spare moment on the problem of eliminating the commutator in DC machines and harnessing AC power without cumbersome intermediaries. He eventually had a sudden flash of inspiration, when he pictured a detailed image of the AC motor. Working patent model of Tesla’s AC induction motor. By Nikola Tesla, 1917. Source: Wikimedia Commons. The concept of an AC motor involved a combination of stationary electromagnetic coils (called the stator) and rotating electromagnetic coils (called the rotor) to convert motion into electric current and vice versa. Tesla firmly believed that the rotating magnetic field could be produced using AC. Although this was an intellectual turning point in Tesla’s life, he did not yet have the practical expertise to build an electrical machine. Experimenting on his AC motor, Tesla built a motor consisting of a disc-shaped iron rotor mounted on a shaft. The stator was two coils of insulated wire mounted on an oblong brass ring. The stator’s windings were connected to an AC electrical generator. Tesla expected the AC from the generator to produce a rotating magnetic field in the stator. In turn, the rotating field would induce currents in the disc; the induced currents would be repelled by the rotating field and thus the disc would rotate. It was the simplest motor Tesla could conceive of. An early prototype of Tesla’s AC motor. Photo by Daderot. CC0. Source: Wikimedia Commons. At first, it didn’t work. The stator coil was wound around a brass core that could not be magnetized. Tesla tried using a steel file in the coil, which induced currents but did not turn the disc. Finally, he found a position where the magnetic field in the file and the induced currents in the disc were in the same direction, so that they repelled each other and caused the disc to slowly rotate. This was a turning point: Tesla realised that materials count – the core of the stator needed to be made of iron or steel, not brass. He was learning how to convert ideals into working devices. 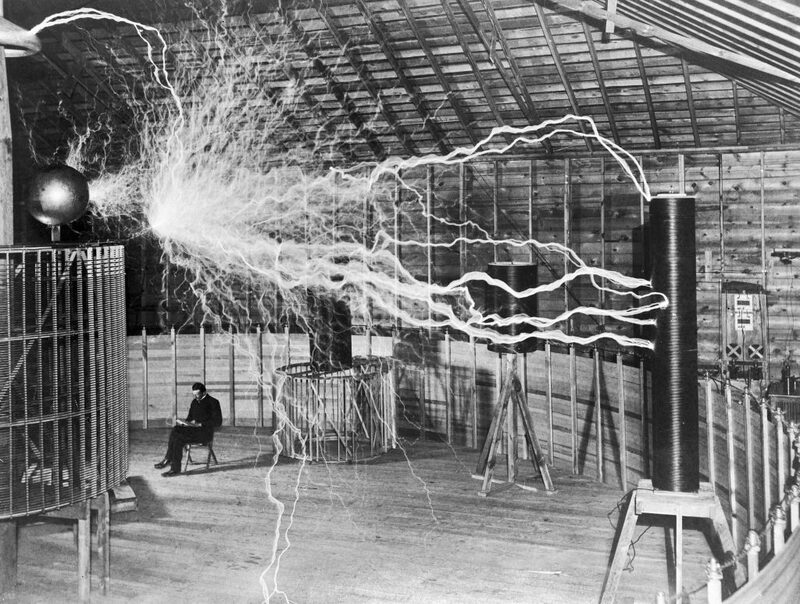 Tesla with his equipment. Photo by Dickenson V. Alley. Restored by Lošmi. CC BY-SA 4.0. Source: Wikimedia Commons. Tesla was sent by the Edison Company (for whom he was working) to America in 1884. In March 1886, Tesla filed a patent application for a thermomagnetic motor and went on to work with Alfred S. Brown, a senior Western Union manager, a first-class electrician and an expert in underground telegraph work, and Charles F. Peck, a lawyer, on a business enterprise to develop Tesla’s inventions. While working with Peck and Brown, Tesla worked out how to build an electric motor, using the rotating magnetic field he had envisioned years before. He modified a DC dynamo in the lab so that it could produce two, three or four separate alternating currents. He used a large laminated ring for the stator, similar to the one in his Strasbourg experiment. He now divided the winding into four separate coils. The AC generator delivered two separate currents to coils on opposite sides of the ring. For the rotor, he balanced a shoe polish tin on a pin in the centre of the ring. The rotating magnetic field caused the tin to spin. A M7 Standard Tesla AC Motor, produced by Westinghouse Electric Co. Photo by: Daderot. CC0. Source: Wikimedia Commons. Tesla had finally worked out how to combine alternating currents to create a rotating magnetic field in the motor’s stator. The currents delivered to each pair of coils had to be out of phase with one another. While one current was at its maximum positive value, the other was at its maximum negative value. Brown and Peck were initially sceptical about the value of an AC motor, but became ardent supporters after Tesla demonstrated his AC motor. Tesla pushed ahead to create AC motors using two or more alternating currents that were out of phase with each other, known as polyphase motors. Guided by Peck and Brown, Tesla made patent applications for all his ideas, his motor was publicized among the engineering community, and he gave lecture-demonstrations on his motor. The AC motor has transformed our world: AC motors are the most commonly used electrical machines today. Industrial fans, household appliances, electric wristwatches, and much more use this technology. One of Tesla’s great interests was wireless power transmission. In 1898, Guglielmo Marconi (1874-1937) had developed his own wireless telegraphy system in the 1890s. In 1898 he sent wireless messages distances of eighty to one hundred miles, demonstrating his apparatus publicly. Tesla had also been experimenting with wireless transmission, but had made no public demonstrations. Not to be outdone, Tesla declared that he would send messages instantaneously around the world. He moved to Colorado Springs, where he constructed a laboratory and an enormous magnifying transmitter. He conducted experiments on the earth’s electrical energy, discovering stationary electromagnetic waves and how they travelled through the earth. He succeeded in producing these waves with an oscillator to transmit power through the earth wirelessly. This is how Telsa would send his messages. 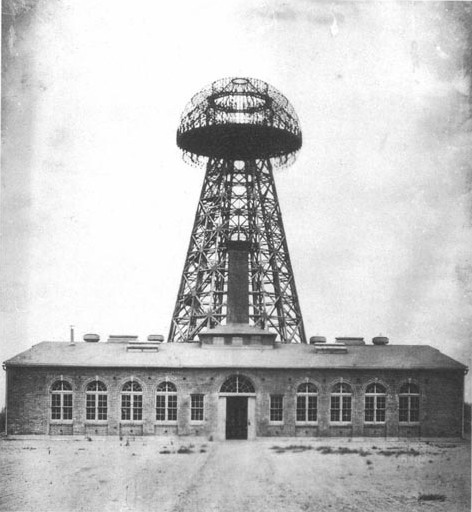 With funding from investment banker J.P. Morgan (1837-1913), Tesla built a new laboratory and tower to demonstrate his wireless telegraphy at Wardenclyffe, 65 miles from New York City, in September 1902. Wardenclyffe Tower, Shoreham, Long Island, New York, 1904. Source: Wikimedia Commons. Tesla proposed a plan to Morgan for a “World Telegraphy System”, in which a number of power plants located near urban areas would be connected by wires or cables to the cities nearby. As they received news, they would spread the messages through the ground to be received by a small device, no larger than a watch. The energy in the earth is sufficient to operate the equipment needed, and the number of devices which could be used is infinite, Tesla argued. Unluckily for the world, J.P. Morgan withdrew support for Tesla’s plan to transmit worldwide power, believing that the wireless industry had entered a speculative phase. Tesla’s debts mounted. Struggling with the financial and technical problems in developing his wireless transmitter, Tesla had a mental breakdown in 1905 and never again attempted such an ambitious project. 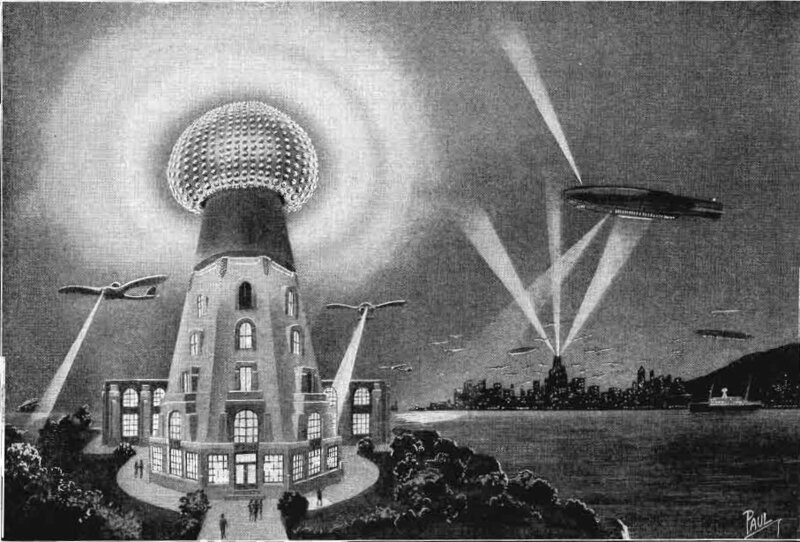 An artist’s conception of what Nikola Tesla’s wireless power transmission system might look like in the future. By Frank R. Paul, 1925. Source: Wikimedia Commons. Tesla was a creative genius, whose visions revolutionized the use of electric power in nineteenth and twentieth century society. Not limited by conventional thinking, his vivid imagination allowed him to visualize new creations. Importantly, he learnt through careful, intense analysis, use of mathematics, and experimentation how to turn his visions into practical inventions. Tesla’s AC motor changed the American economy at the end of the nineteenth and the start of the twentieth century. It was essential to making electricity a service that could be mass-produced and mass-distributed, allowing companies to increase the size of their systems, pursue economies of scale and reduce the cost of electricity in the long-term. It’s believed that Tesla intended to offer free electricity to the world. Now that would have been revolutionary. Tesla: inventor of the electrical age by W. Bernard Carlson. The fantastic inventions of Nikola Tesla by Nikola Tesla & David H. Childress. Wizard: the life and times of Nikola Tesla: biography of a genius by Marc J. Seifer. Empires of light: Edison, Tesla, Westinghouse, and the race to electrify the world by Jill Jonnes. The man who invented the 20th century: Nikola Tesla, forgotten genius of electricity by Robert Lomas. I salute the Genius man Tesla Without him we are know where right now. The man ignored by the world. Without him we would not have technology we have today. The onley country celebrating him is his “Mother Land”.. They inherited his estate that consist of his inventions..